A few years ago, a young lady from Townsville, took a holiday to Vietnam. She was going to stay for a few weeks. She stayed for a few years. 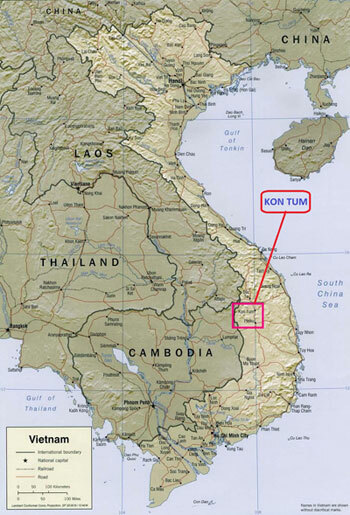 Somewhere along the way she visited a city in the Central Highlands of Vietnam called Kon Tum and while there, came into contact with some orphanages, known as Vinh Son 1 and Vinh Son 2. She dedicated her time to support the children of these orphanages. All the children are ethnic minority people, generically known as Montagnards. There are over 50 tribes of Montagnards across Vietnam. In Kon Tum the better known tribes are Bahnar, Jarai, Sedang and Rungau. Derek Smith, founder of [email protected] knew the girl and her parents. He began raising funds to support her cause. Derek is a veteran of the Vietnam War, having served there in 1966, 1969 and 1971. He served 24 years in the Australian Army, retiring in 1986 with the rank of major. He is now on a TPI (totally and permanently incapacitated) veteran’s pension. The young lady left Vietnam to continue her wonderful work, in Cambodia. Derek decided to pick up where she left off and first visited Kon Tum in 2007. He and other volunteers have been going back each year, sometimes twice a year, to provide support for the children of VSO, and so [email protected] came to be.